Aussie trimmed RBA-related losses, bulls cautious ahead of first-tier Chinese Q1 GDP. March Australian Westpac Leading Index could confirm RBA's gloomy economic outlook. The AUD/USD pair fell during the Asian session, but trimmed losses in the last trading session, closing a third consecutive day in the 0.7170 price zone. The early decline was driven by the RBA as the central bank's meeting Minutes showed that most policymakers expect inflation to remain mute for some time. Furthermore, board members said they would favor a rate cut if inflation remains low, somehow confirming speculation that an upcoming rate cut is around the corner. The pair later recovered as solid earnings reports in the US pushed equities to fresh intraday yearly highs. 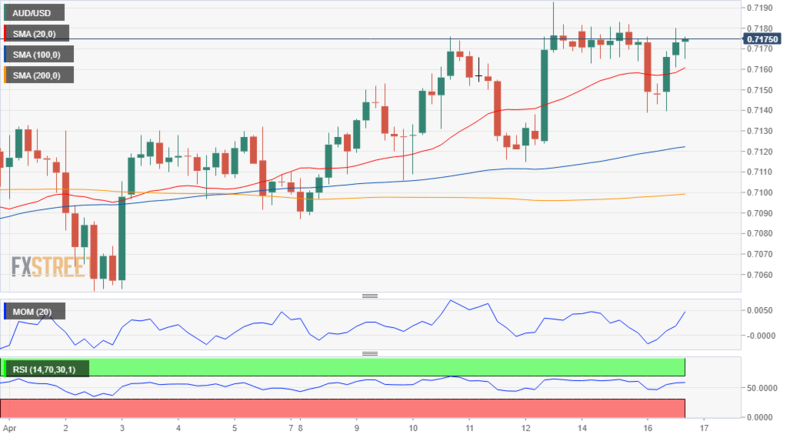 The AUD/USD pair rally stalled below 0.7200 as investors are now waiting for the Australian Westpac Leading Index for March, and a batch of Chinese figures, including Q1 GDP. Chinese growth is foreseen up by 6.3% YoY in the first three months of the year, worse than the previous 6.4% from the previous quarter. The country will also release March Retail Sales, seen rising by 8.4% YoY, and Industrial Production for the same period, seen up by 5.9% vs. the previous 5.3%. The technical picture is mixed short term, as the intraday slide put an upward continuation at risk, although next directional move will depend mostly on Chinese news. The 4 hours chart shows that the pair pierced its 20 SMA, although the indicator resumed its advance as the following recovery as quite fast. The Momentum indicator in the mentioned chart maintains its downward slope just below its midline as the pair is unable to enter into positive territory weekly basis, while the RSI advances modestly at around 57, keeping the risk skewed to the downside.